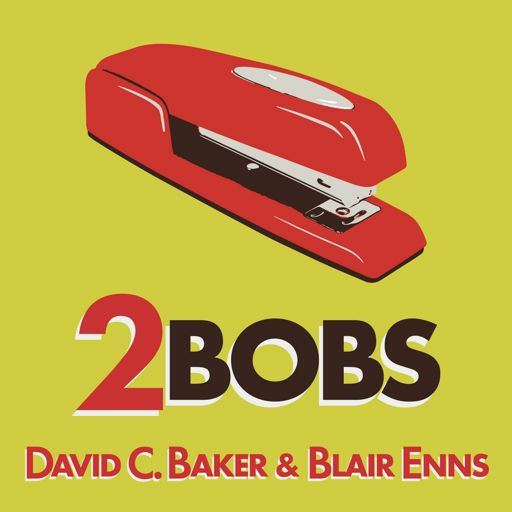 2Bobs Episode 31 - "Mastering the Value Conversation"
BLAIR ENNS: David, it's been a while. DAVID C. BAKER: Has it? I haven't missed you all that much. Have you missed me? BLAIR: Since we've last recorded a podcast, I was listening to one that aired recently and it was talking about my first book is in its fourth printing. It's now going into its fifth printing and I realized that it just aired and we recorded that over a year ago. So if Marcus is digging into a backlog that far, that means we haven't been together for a while. DAVID: Yeah. And it's scary too because imagine how much our thinking has changed in a year? 'Cause you were wrong about so many things. BLAIR: That's an old joke, you need new material. BLAIR: So since we've last recorded a podcast, I know they keep airing because we've got all this in the can, but you and I did an event in London and then we came home and then you and your wife came up to Kaslo and we celebrated. I was just looking yesterday at a photo of your wife and my wife in a bear den together on her birthday. DAVID: Right, I didn't want to go in it, it's why I took the picture. BLAIR: You're too smart. I took it from inside the bear den, you were outside. BLAIR: And then you went to Chile on vacation and then you've probably been in some other places. DAVID: Yes, I have. I'm kind of off the road right now. I head back out of the country on Friday but I've been back trying to get our 61 acre farm livable. So just a few minutes ago, if you'd seen a picture of me, I would have been covered in white from head to toe because I am still trying to figure out how to use a paint sprayer and I realized I have a lot of expertise to develop yet. BLAIR: That's why on a hike I was carrying the bear spray. Okay, so it's been a while since we talked. Today we're going to talk, I want to call it good, better, best but it's really the three levels of success in running a creative firm and I think you've broken it down into the categories of starting, existing and thriving. And you sent me an entire spreadsheet to help navigate this conversation. Things like utilization, positioning, financial, marketing, etc. All of these different things that should be true or should be happening or you should be aiming for at these three different levels of success. Do you want to just take a minute and talk about those three levels of success? Are there lines that delineate between starting and existing and existing and thriving? Well, I think there are. We'll find out I guess, right? But I tend to think in triads. And so as I'm getting a question from a client, I'll sometimes just play this mental game, are they starting out or are they existing or are they thriving? And there seem to be these three different categories. And then you can expand that and say, "Okay, what about financial performance? What about how they think about service offerings or how they think about positioning and how they think about management?" And so I think it's useful to think in these categories because it's not as if a single firm is all in the existing, the middle category. They might spread across different ones and just gives us an eye opening into what our world looks like from the outside. DAVID: I think it'll be kind of interesting to talk about. But you're probably going to let me know how interesting this is or not. If you rush me through these, that'll be a sign that it's not that interesting. BLAIR: Well, let's just see. Let's start with utilization which is the first thing on your list. DAVID: Right. 'Cause such an exciting word, right? Utilization. BLAIR: Yeah. So I'll just have a little nap here while you talk about utilization. DAVID: Like I said to you one day, I'm pre-interested. Okay, so starting would be subsidizing clients and the typical firm in a developed country is charging and getting paid for 42% of their time and they should be getting paid for 60% of their time. So most firms are in this starting category and they never really get out of it. It's more of a typical category. So there's some significant degree of underpricing and/or overservicing. And that's the first one, subsidizing clients. And then hopefully, we get to the point where we get paid for everything we're doing, that's the middle category of existing. And then thriving is package pricing where we're applying what you would call value pricing. Where there's very little corelation between what we're getting paid and the amount of time we're putting in. It's really more about outputs and accomplishments and so on. The thing that interests me about this and I'm curious to hear your thoughts on this as well, is that most firms want to skip the middle step. So they're not getting paid for all their time and they want to jump right to value pricing without going through the middle step of getting paid for all the time that they're working. And some of this is influenced by this hatred that everybody has for timekeeping, but it's also driven by this sense that people have of they're being cheated. It's like, "My clients are not paying me what I'm worth and I feel rotten about that, I feel anxious, I feel resentful and I want to jump right past that and go straight to getting paid for more than the time I'm spending." So that's the first one, utilization. BLAIR: Well, I wonder if that leap isn't because they're not really thinking about value-based pricing in terms of getting paid for the value that they create but they see it as kind of a packaged way of actually getting paid for what they do. Does that make sense? DAVID: It does. So they're using a very advanced way of sort of eliminating this subsidization without ... Yeah, it kind of does. I feel like people, they have this resentment level about not getting paid for what they're doing but they don't really know how to solve it and they jump into different plans to solve it without really understanding all of them. This is what you've spent so much of your professional life doing in the last couple of years, is helping them think through. Like we did a podcast recently about the value conversation and all of those things. And in London when you and I were talking, I was listening when you were talking about practicing the value conversation. And it was so interesting for people, the light came on on their eyes. And I don't know exactly why but I feel like they need to at least go through this second phase first because it's like learning to walk before you can run and run before you can whatever the next thing is, leap I guess. BLAIR: Yeah. And I wonder about that. I kind of think if I were giving somebody who's starting out right now some advice, my advice would be to skip over that middle section of getting paid for what you do. But if I may, I want to back up a little bit and just talk about these three categories of starting, existing and thriving and let's just put some description around them. I think we can agree that in the starting phase, essentially you have a hypothesis and your hypothesis is that you have something of value that the market values and that maybe there's a business there. So you open your doors and you're essentially exploring your hypothesis. You don't know whether you validated or not. There's all kinds of fear and there's all kinds of experimentation and there's all kinds of hard work and you're trying different things and you're seeking validation. And I would say in the existing stage, you have validation, there's a business here. You're not going to go out of business tomorrow but probably you're earning like what you would in a job, maybe a little bit more. So it's okay, I have validation from the marketplace and then the next step is essentially optimization or getting ... Another way to look at it would be the third category which is thriving. Beyond existing, beyond earning what you would in a job. And I know I'm probably jumping ahead and maybe screwing up some of your things that you want to talk about here but we all have a sense of what thriving is and we all have a sense of what starting is. Starting is you were working with a hypothesis. Existing in the middle is I validated it. There's something here, now we need to take it to the next level. And thriving is the next level. Are those good enough descriptions for the three categories we're talking about? BLAIR: Or would you change them? DAVID: No, I think they are good enough. What's interesting to me though, is that some businesses that have been around for 10 years are still in the starting category and they don't ever get to that other one. And those are the ones where I might go in and say, "Hey, just an idea here, but have you considered that maybe you shouldn't be running a firm? You could be making a lot more money working for somebody else, you'd be working fewer hours and you'd have no financial risk." BLAIR: And you'd be sleeping better at night. DAVID: Right, exactly. All those things. Most folks just sort of look at me and grin and say, "Yeah, I know all that but I'm willing to invest that much just so that I don't have a boss." You don't automatically go from starting to existing after you cross, say a two year threshold or something like that. There is some mentality that has to change on your part. BLAIR: Yeah. Okay, so you talked about the first point of how utilization is different in these three categories of starting, existing and thriving. You go from essentially subsidizing your clients to getting paid for what you do to charging based on the value that you create or package pricing. The next thing that you want to explore under these three categories is positioning. So how does positioning change? DAVID: And this is a little bit different than we would have talked about it probably 10 years ago maybe. You and I both noticed that that's changed in the marketplace. So in the beginning, you're usually an undifferentiated firm. So there are many viable substitutes for what you do. And most firms make this transition for sure, they go into the existing category. And in this phase, and I delineate this scientifically in the book, The Business of Expertise, you need between 10 and 200 competitors and then we can talk about what that means in terms of your prospects set and so on. How many prospects you need. But most firms don't go into that third phase there where there are no competitors essentially because of some process they have or some proprietary IP or some black box. That's where you see firms thriving and they're making so much money. It's not wrong at all, it's just that they really control their marketplace. And so, most people in this category are probably in this existing, the middle phase, and very few are at the undifferentiated and very few are at the proprietary IP side. I'm not sure what that number is, I'd be interested to see what you think. I would guess that maybe 10% of firms are in that high level, less than that maybe. BLAIR: I'm going to recap what you said here. So positioning-wise, when you're starting out, you're saying the firm begins as fully undifferentiated. You're basically saying yes to everything and taking whatever you can. And then when you get to the existing phase where you kind of validated your hypothesis, you typically have 10 to 200 competitors. And then in the thriving phase or stage, you say you essentially have no direct competitors because you have proprietary intellectual property. Is that right? DAVID: Right, a black box. Something that they just simply cannot get somewhere else. And that's built on the second phase for sure. You start at the 10 to 200 competitor phase but then you figure out some magic and you bring it to the marketplace. And that's where just the light comes on and everything just falls in place for you. BLAIR: I want to suggest the slightly different way to think about this. And that is at the very beginning, you starting out, when you have one client, your firm is highly specialized. BLAIR: You're specialized in the discipline for market, you're doing x for why, you have one client. And then I'll suggest to you that your second client is a lot like your first client. And it's often because that first client maybe you took that client with you from another firm or whatever. He was attracted to you for whatever reason. Your second client is a lot like your first client so you're a highly specialized entity. And then you think, "Oh my god, I have to mitigate my risk. I don't want to put all of my eggs in one basket. I don't want to pigeonholed." And then you broaden out. DAVID: And then you mess up your positioning with all these other clients. DAVID: That's interesting, I never thought about that. That is really interesting. So the secret is to never have more than one or two clients and then your ... That's Blair's advice for the day. BLAIR: Okay. Now let's move on to the category or employees. How does your employee base change as you go from starting to existing to thriving? DAVID: This one is really fun to me because I think everybody will identify with this. In the first phase, you're hiring what you can afford. It's just like, "What? I can't pay more than this and I know the kind of expertise I would like, I just cannot afford it. So the primary thing is this is what I can afford and I'm just going to get the most capable person I can with this amount of money." That's the first phase. BLAIR: Yeah. We can all identify with that. DAVID: Yeah. And none of those people are still working for you but you still remember those days. DAVID: And the second phase is existing. And here there's this flip that occurs in your mind and you begin to hire for what you need even if it stretches you financially and you grow into it. So it's not what you can afford, it's what you need and you've built this new assumption on the fact that you're tired of training people, these blank slates that come to you and infusing them with everything you know. But the firm never grows beyond that because who's smarter than you is getting hired because you can't afford them. So the second phase, what do I need even if it costs more than I really I'm comfortable spending at this point? The third phase is a really fun one. And that's where you are on the lookout for amazing once in a lifetime hires. And even if you don't need that person at this point, you go ahead and snug them because you're running your firm so well that it's not going to put you under to have an extra and actually a highly paid extra person on staff. And this is that third phase where you make the once in a lifetime hire every once in a while even when you don't quite need them yet. BLAIR: I immediately recall a number of conversations I've had with my most successful clients and I'm sure you do too. You've had the same conversations where you asked about a particular team member and they said, "Oh, that person came to me, I didn't have a job for them but I just couldn't believe there skillset. So I hired them and I created a job for them." DAVID: Right, exactly. That's exactly what we're talking about. And it's so fun to be at that point in your businesses' history where you can do that. It's such a luxury. BLAIR: Yeah. Let's talk about financial. You've got some financial numbers and I want to know where the hell they came from. First, why don't you walk us through them. When you're staring out, you should be earning what? DAVID: So this financial thing is about how much money you're making. And in the first phase, it seems like principals are making 160 to 200 in U.S. dollars and there's not much more beyond that. That's pretty much what they get. They may not even get every pay check, they may catch up sometimes or they may not, but they're making 160 or 200. If they stop and thought about it, they would say "You know, I could make more money somewhere else." That's the first phase starting. Existing, they may make the same amount of money. 160 to 200,000 U.S. dollar equivalent, but there's significant profit at the end of the year. And this builds up starting at their fiscal year and they may take out some quarterly or when they're getting ready to buy a boat or another house or whatever, but there is some profit. And then in the thriving, the final one, the third one, they're making 400,000. Now, we have to index this if there's more than one principal but there's 400,000 plus a bunch of profit. And there are not many ... Again, they're probably on a 10 to 20% of firms in this third category with all the things that we're talking about and especially here, 400,000 plus profit. That's where firms are really thriving. BLAIR: So I'm imagining the principal of a firm who's in the starting phase, they've been at this like 15 months, they're into their second year. They're still starting, they're still figuring it out and they're thinking, "Whoa, I should be making 160 to 200? When does that happen?" DAVID: Yeah. Where somebody who's making 400 says, "I can't remember when I only made that amount of money." People's expectations are so different based on what they bring to the table. DAVID: But what principal could not make that and more as a key leader at another firm? It kind of gets crazy when you think about it. BLAIR: But are you saying if you're at the starting phase, let's say you're a year in and you're not at 160, what does that tell you? DAVID: Well, I think we need to make allowance for the fact that we're going to invest in our businesses. But if somebody's starting out and they don't have employees, it's hard for me to foul them. Anybody making less than 160,000 equivalent U.S. dollars, I have to search a long time before I find somebody making less than that. So it tells me that either you're really starting out and haven't figured out some things or your expectations around money are very different than mine are. Or you're really making some huge investments in the business and you'll grow out of that at some point. But it should signal that something's wrong if you're not regularly making that amount of money very quickly out of the gate. BLAIR: Yeah, okay. And we could do some math on that around utilization rates and hourly rates etcetera, to come up with something, but we won't. Let's keep moving. BLAIR: So the next category you have here is marketing. And when you're first starting out, how do you about getting new leads that ultimately turn into clients? DAVID: Yeah, most people don't do anything because they usually don't start with the blank slate. They usually start because some client has said on the Q.T., "Hey I want to work with you." And so they start with some promise of work. Or they're kind of the new kid in town and for the first, and I find that it's about three and a half years, that's about how long it last, they have enough referrals or just word of mouth kind of stuff happening. And then if things slow down a little bit, they'll do some cold-calling. That's what usually happens at this first phase and it kind of creates these bad habits for folks in the early days because it lasts for three, three and a half years and then it starts to tail off. Then we go into the second phase of existing where most firms rely on email marketing these days. Now you have some outliers who are doing different things but that seems to be the basic recommendation, email marketing. And it's still very effective and some firms are getting very wealthy doing that as their primary lead generation tool. But not many firms are really in the thriving category who are relying primarily on email marketing. They're doing something else, they have some notorious thought leadership and there are many things that fall in this category. They could have written a great book or they could be a great speaker who gets invited to different keynote conference opportunities or maybe they have a podcast or something like that, but it's moving beyond the email marketing. And so cold-calling, referrals at the beginning, email marketing and then they leave that behind and they have this luxury of moving to more of a notorious thought leadership platform. BLAIR: I love your choice of an adjective there, notorious. What do you mean by that? DAVID: Notorious as in hated? No, that's not what I ... What I mean is well-known I guess is what I mean. So it wouldn't count to have a podcast that nobody listens to or a book that nobody buys. I'm talking about well-known type of thought leadership. And like you talk about often, it's probably something that's singular. Like it might be a conference that you do or it might be a book or it could be a podcast. It's usually not a combination of a lot of things. You've just fallen into a groove, a pattern that fits your personality and your particular focus in the marketplace and everything is working well. And as long as you're disciplined and you still take risks with your thought leadership, then you don't ever have to go back to just doing email marketing like you used to. BLAIR: Yeah. And so you've got referrals along with cold-calling in the starting category, but I think when done properly, referrals follow you at every level. And at the thriving level, I would suggest referrals really do come back. But I think your point is that like in the very beginning, it really is just about referrals. The first client is referred to you or they were a client at the firm that you worked at, you took with you. And you said there's a three to three and a half year cycle for referrals. I don't know if it's referral-based but I've talked about this before. And one of the first patterns that I saw as a consultant is there's a seven year window. There's a point at which where roughly seven years where organic growth just stops. And you explained to me, your hypothesis was that's when you thought natural referrals quit working. And then there's school of thought around how you actually worked to cultivate referrals, that's an entirely different level. But I think we should probably do a podcast on referrals at some point because that's a topic in of itself. And I agree with you, it's vital early and then most people kind of let it go. But some of those firms that are really thriving, they have formalized how they get their existing advocate, loyal clients to refer other clients to them. DAVID: Yes, exactly. They're intentional about it. And the difference seems to me is that they bring their referral sources along with them. So as their capabilities change, they are providing the correct language to those referrals in an active way, so that the referral sources are given them even better business than they did in the past. That is something we should talk more about. BLAIR: Okay. Let's talk about fee billings per FTE. This is one of my favorite numbers that we often refer to it as AGI per FTE, which is ... Do you want to explain that acronym? DAVID: Sure. So AGI stands for Agency Gross Income. The rest of the world would say adjusted growth income but that's a very different meaning than what we mean by AGI in this industry, and it's basically your fee billing. And then if we define FTE equivalence, if there are nine full-timers and two halftimers, then that's 10 full-time equivalent. So the starting phase is less than $150,000 per full-time equivalent. So we have a 10 person firm, that means that their AGI is less than 1.5 million. There's some sort of a transition here that firms struggle to get beyond and they don't exactly know how to break out of that. It's a combination of all kinds of marketing and positioning and lead generation and confidence and all those things that we talk about quite a bit. But in this first phase, they're somewhere below this. The second phase is a really narrow band. It's really interesting. I can almost say on the phone, I can say to somebody, a prospect that I might be talking with, I can say, "Let me take a guess, you don't have to tell me if I'm right or not, but I'll bet your fee billings per full-time equivalent ..." And then I'll give them a number between 150 and 160. And this very narrow band is the second place they get stuck. And most firms, the vast majority, never get above 160. And the ones who thrive in this third category get above 160, and I've got clients that are even above a million, many of them above 450, 500. Now, you can't get there without value pricing obviously and packaging the work that you're doing with expected service offerings and so on. So those are the three, less than 150, 150 to 160, the big stuck point, and then above 160. BLAIR: So, again, I'm going to give you another way to think about this because when you say starting, that first phase or stage that we're talking about, I'm thinking about a solopreneur. And a solopreneur, if you're making 200, you're clearly billing more than 200. If you think of the solo creative person who goes out on his or her own, they're subsidizing the clients so they're not billing for all of the time that they're actually spending as you pointed out at the beginning. So they run into this maximum of how much they can based on the fact that they're subsidizing their clients. And it's probably around ... What do you think it is? Like what do you think somebody's earning, just say in kind of gross sales, before they have to hire that first person? DAVID: They probably should never hire anybody until they're at the quarter of a million dollar range, so about 250 I would think. When you hire somebody before that, you're really restarting the clock and now all of a sudden you're spreading this income that you've generated across more and more people. I don't see much connection between billings per full-time equivalent and the size of the firm. In other words, some of the most profitable firms are smaller but not always. So when I say starting, I don't necessarily mean the business is young, I mean they're starting on this path of entrepreneurial experience and success. So many firms could be 20 years old and they've never broken that 160 category per employee. So it's just something about like how do I get over this hump? And it may take people two years or it might take them 20 years or they may never get over that hump at all. BLAIR: Yeah. So you have these three categories of you're below 150 in AGI per FTE and then the middle category, where I see a lot of it too, you're stuck at 150 to 160. And I would say it might even be a little bit lower than that, 140 to 160. I don't know where the line is, you're drawing at 150 to 160. And then beyond that 160, once you tend to break free of that 160, then you kind of gain momentum again and it's easier to get out into the 200s and even 300s and that's almost always because you're moving to a value-based pricing. Is that right? DAVID: Right. Or you're very, very confident. But usually, yes. It's about value-based pricing. BLAIR: Yeah. All right, the next category is succession. So in a starting firm, it seems a little bit ironic that a firm that's in the starting category would think of succession. Because if you're just starting out and you're thinking of getting out, then something's not working therefore you don't have anything to sell, do you? DAVID: Well, again, I'm not talking just about chronology, I'm also talking about how successful they've walked this road of entrepreneurial success. And so many firms really are ... You have a 20 year firm and really they don't have 20 years of expertise under their belt, they have 20, one year periods under their belt. They don't operate like a 20 year firm, they just had the same one year 20 times, that's what I mean by starting. BLAIR: It's Groundhog Day 20 days in a row. DAVID: Exactly, right. And these are the firms where they're not just remarkable per financial performance and therefore nobody on the outside is going to be all that intrigued with buying the firm and yet the principal is tired. They're tired in part because of the lack of financial performance. If that wasn't the case, they probably wouldn't be that tired so they have to settle for either just closing the firm or getting almost nothing for it by selling to employees. That's that first starting phase of entrepreneurial success. DAVID: And then in the second one, in this existing phase, they sell or merge within the industry. And you and I have seen huge changes here. There aren't many firms who are selling to the holding companies because the holding companies don't have all that much extra money and those purchases are so typical and the principal is not that interested in it but that's what happens in this existing phase. And then in the thriving phase, they get rich by selling in a very nontraditional sale. So it might be a consulting firm that buys them or it might be a huge digital firm that buys them. Or they could sell themselves to a client or maybe a roll-up in some rare circumstances. So it's just interesting to think about these three different categories that firms tend to think about from a succession standpoint. I put this on the list 'cause I do so much succession work and I see people strange expectations about what the firm will be worth. And they have this very glorious ideas about what somebody else will be pay for the firm and I have to have an awkward conversation. It's like, "You know, this has been more of a lifestyle business for you. You haven't made a lot of money, you've not made a lot of profit, there's not much to sell after you leave." But that's fortunately not true of every firm. A lot of firms are very, very saleable these days which is great news for them. BLAIR: And it reminds me of John Warrillow's book, Built to Sell. It's a business novel and the owner of a design firm is fed up and he goes to his business advisor or his accountant and says, "Okay, I want to sell the firm." And the guy laughs at him and says, "You've got nothing to sell." DAVID: Yeah, a great day in his life to find himself. BLAIR: So he helps him navigate to building a business that is built to sell. It's actually a great book and well worth reading. DAVID: Yeah. All right, so I am going to do something here. Are you ready? BLAIR: I'm always ready David. What are you going to do? DAVID: Well, I'm going to flip this on you and I want you to come up with three categories around pricing. BLAIR: Oh yeah, that's easy. DAVID: Okay, well you should have some thoughts about this, you just wrote a book. So what are the three categories for pricing that you see out here? BLAIR: Essentially, you have three things that you can sell and I think the three categories really mirror perfectly your categories of starting, existing and thriving. In the beginning, you are selling time, you are selling the inputs of time and materials. And then when you get to the next level which you're calling existing, and I'll just say it's the next level in pricing, is that's when you're selling outputs of deliverables. So instead of charging based on the time, you're charging based on, I'll put in air quotes, the market value of something. And you're still counting your inputs of time and materials but you're essentially pricing based on what the market will bear and you're probably commanding a premium. The client is getting price certainty. So instead of saying it's going to be $200 an hour and we'll finish when we'll finish, you're making an estimation of the number or hours, probably a range, and then you're pricing it in the higher range and the incentives are for you to come in a bit below that. So your AGI per FTE is going to go up. You're trading a price premium for price certainty because you're selling the deliverables, the campaign, whatever the output is. And then the third level is when you let go of both of those things and you're selling based on the value that you help create. So you're pricing based not on the inputs of time and materials, not on the market value of what you think the market value is, that service or that output, but based on the revenue gains or cost reductions or other emotional forms of value that your solution will help to deliver. And very often when you do it properly, it's really almost fully untethered from the inputs of time and materials. So those are the three levels of pricing. First you're selling inputs, then you're selling outputs then you're selling outcomes or value. DAVID: So if somebody's in the first category of selling inputs, can they skip the second step and go right to value? DAVID: Okay. Oh, that's interesting. BLAIR: Yeah, and so we talked about the value conversation before and if somebody hasn't listened to that, they might want to go back and listen to that episode. Really, the big shift that happens when you learn to conduct a good value conversation is you completely let go of the solutions and if you're letting go of solutions, you're letting go of cost. So you're actually setting price before you even think ... And this is the trick that you've got to learn to do. Before you even think about what it is that you would do for the client. And when you're able to do that, when you're able to set price before you think about your solutions, let alone your cost, then you have made that transition to the next level. DAVID: I hope people will go back there and listen to that one. It's called "Mastering the Value Conversation," April 4th. That was a really interesting one. Allright, this was fun. BLAIR: Hey, I'm driving here, this was fun David. DAVID: No, I'll tell you if it's fun. If it's ... We should do one like: what's starting, existing and thriving to do a podcast together? What are those three categories? I don't think we want to do that. BLAIR: Oh god, yeah. Yeah, we're still starting. Hey, when we reconvene (we're going to record again in a few days) we're going to talk about the X factor. Now, I'm going to send you some homework on this, I'm going to ask you to think about your most successful clients and what did they have in common. And then we're going to talk about that in the next podcast. David and Blair each share a list of things that they wish agency principals would do more of to take their firms to the next level of success.